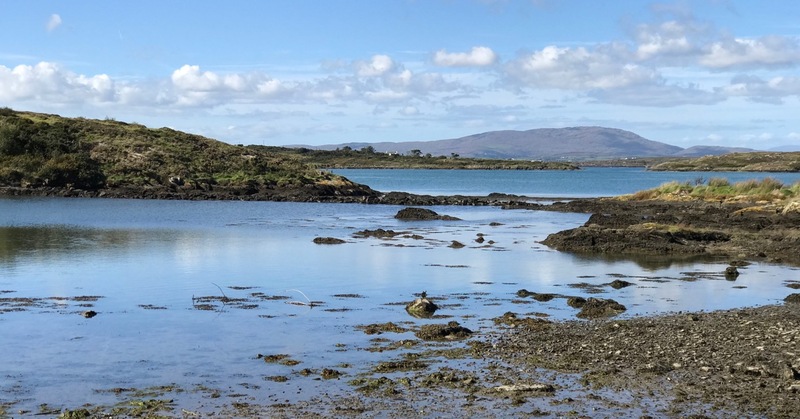 You can’t live in West Cork without constantly being aware of the sea – it’s all around us. And the offshore islands are always in our view as we look across Roaringwater Bay. It’s easy to get to the inhabited ones: there are good ferry services that run year round, although they can be hampered by winter storms. 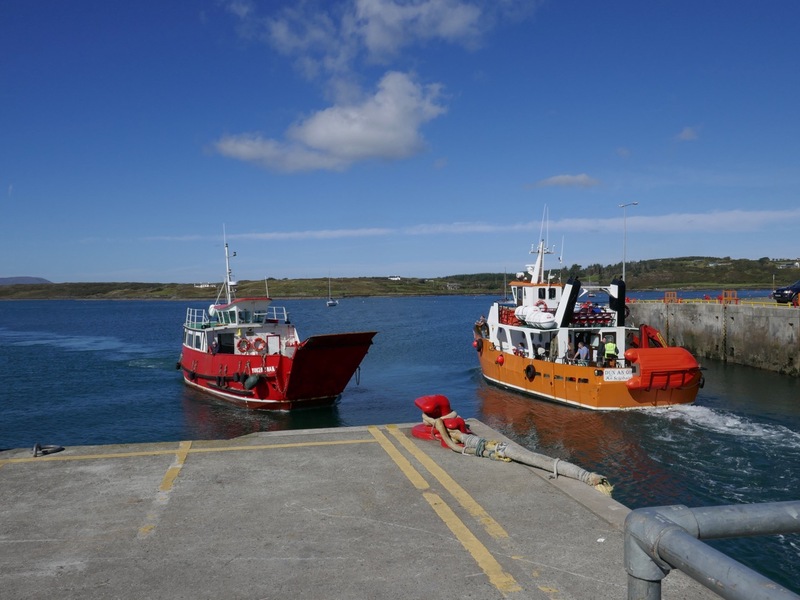 In this picture – above – the Cape Clear Ferry is leaving Baltimore, while the Sherkin Ferry is arriving to collect passengers for that island, including us: on a whim we went across on a wonderful warm September afternoon. 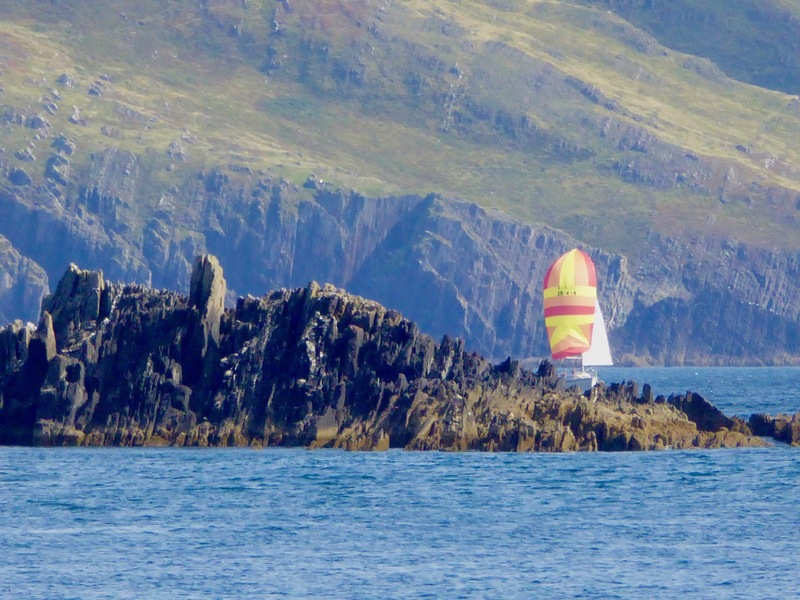 It’s a short sea voyage to Sherkin – all of 15 minutes! But it’s always exciting to be on the water. 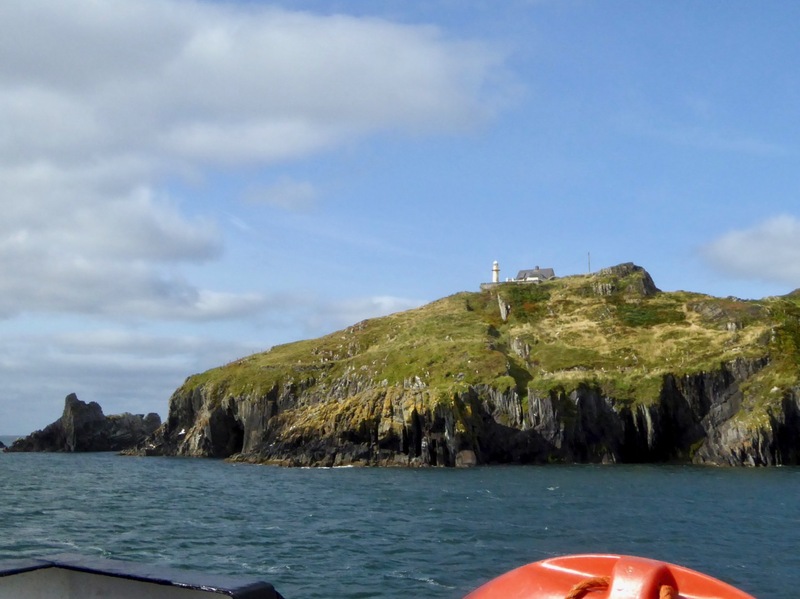 That’s the lighthouse on Sherkin in the picture above: it was built in 1885 of cast-iron construction and is now fully automated, as are all of Ireland’s lighthouses today. We did have an aim – to find a piece of Rock Art that may be the earliest physical evidence of human occupation on the island. 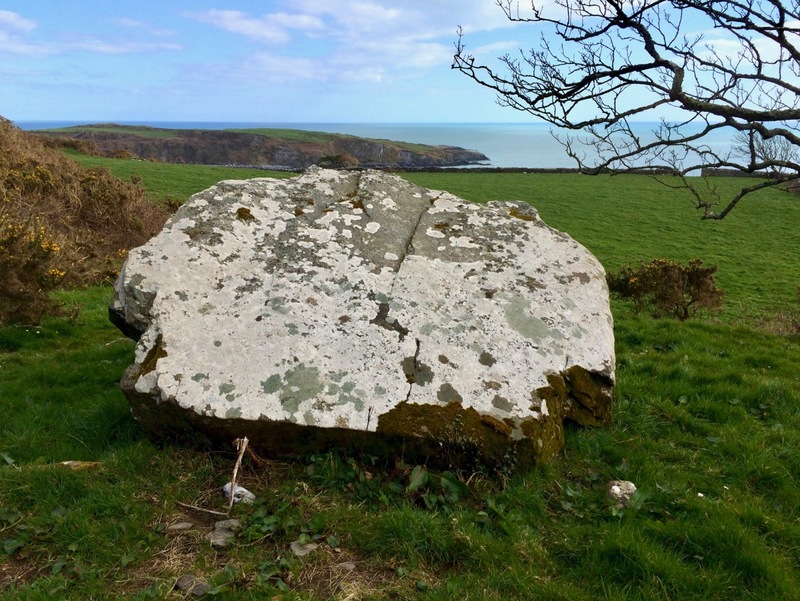 It’s a cupmarked stone in the townland of Kilmoon, overlooking Kinish Harbour. It was a fair walk to the west, over deserted roads and through fields. After a bit of backtracking we managed to find the stone, well weathered but with its markings still visible. 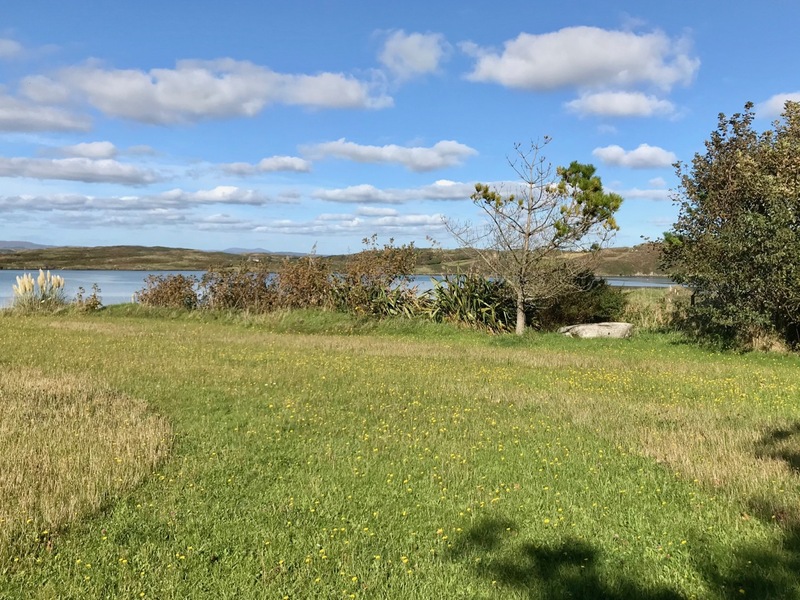 It is situated with panoramic views all the way round, taking in the peaks of Mount Gabriel, Mount Corrin and Mount Kidd on the mainland: surely it must have been placed with those views in mind? This picture shows the cupmarked stone in its present setting, just inside a private garden (if you go, please make sure you seek permission from the owners of the house! ), while the one above shows the panoramic distant view which the stone commands. 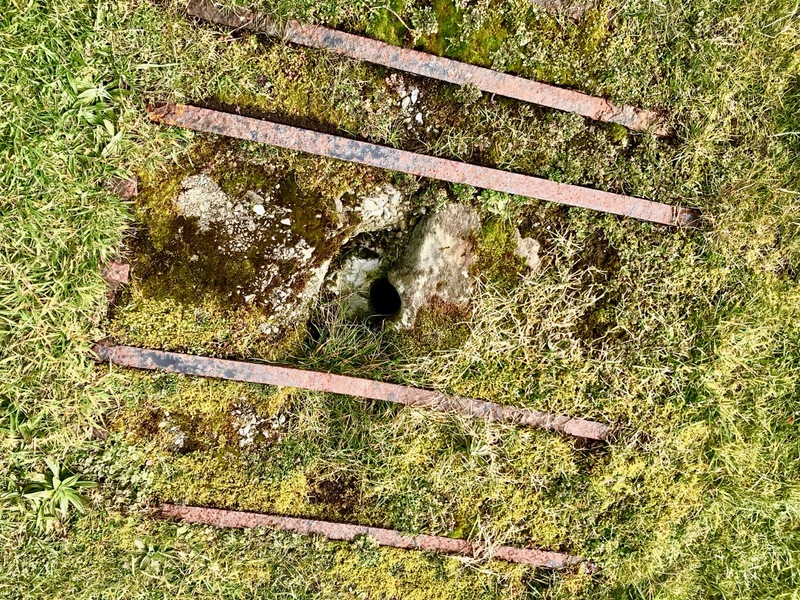 Here is the surface of the stone which is heavily blotched with lichen, but it is possible to make out the well defined cupmarks: there are 14 in all. 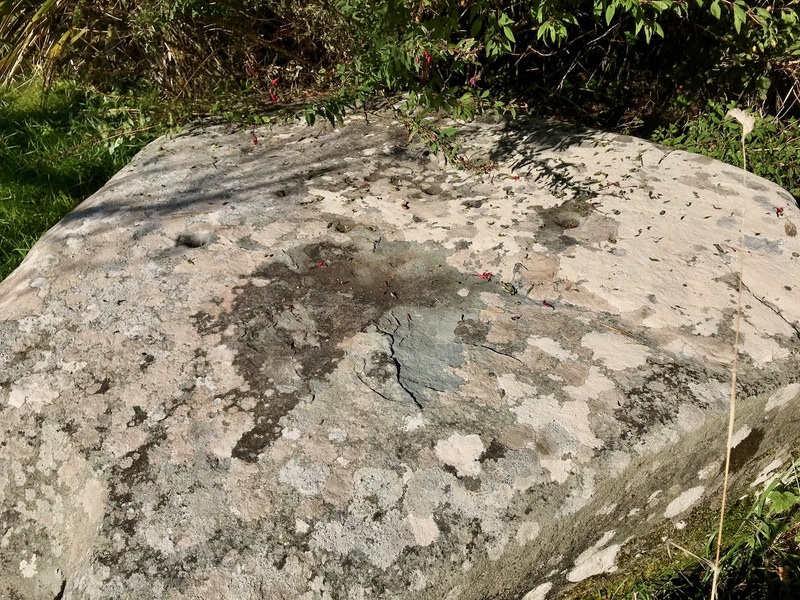 If you want to find out more about cupmarked stones and how they compare with Rock Art in general, we wrote this post a while ago. 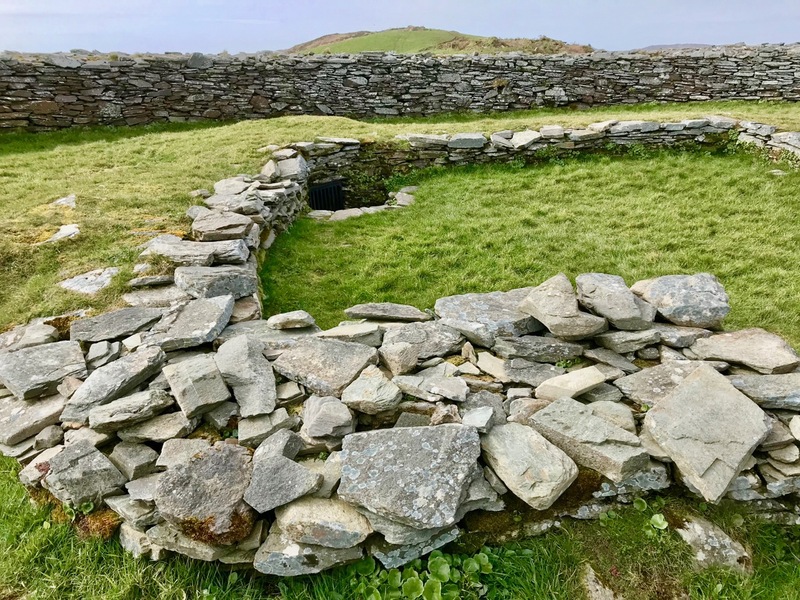 It sparked off a whole lot of debate (have a look at the comments at the end of that post) – and there is still much to be discovered in a history that may go back 5,000 years.
. . . 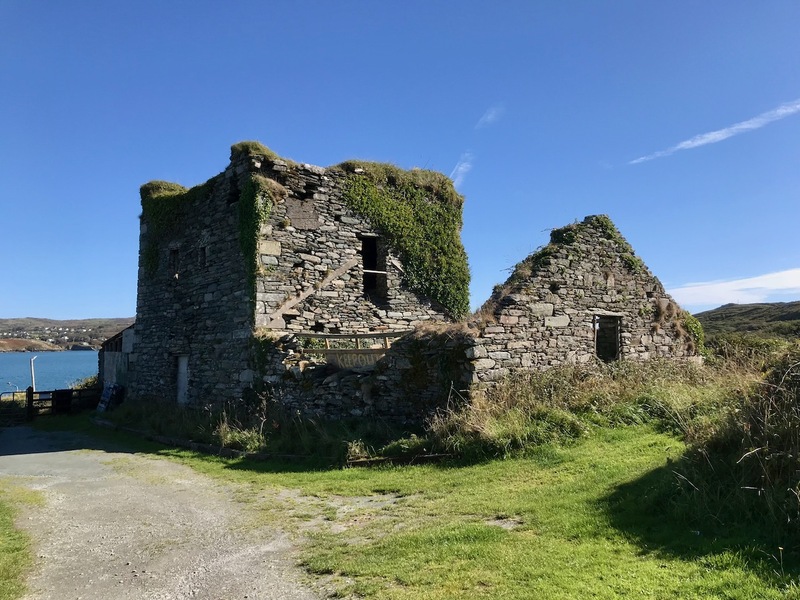 Permission for this foundation was given by Rome to Finighin O’Driscoll in 1449, but it was not until just after 1462 that the Observant friars actually arrived. The friary became the traditional burial place of the O’Driscoll’s. 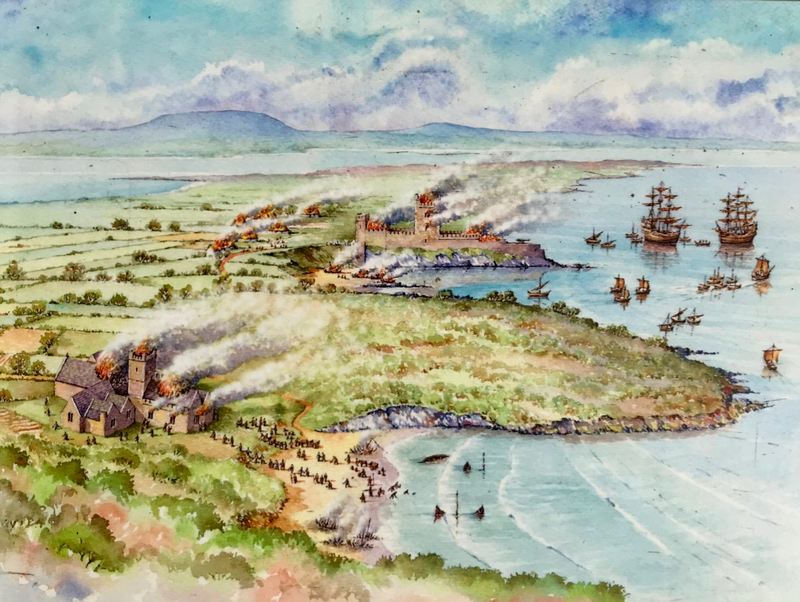 In 1537 the citizens of Waterford burned the building in retaliation for acts of piracy by the O’Driscolls. 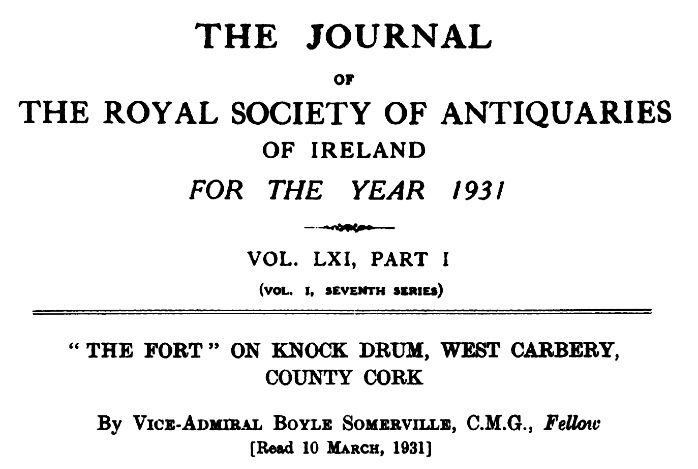 The great bell of the friary was on display in Waterford as late as 1615. 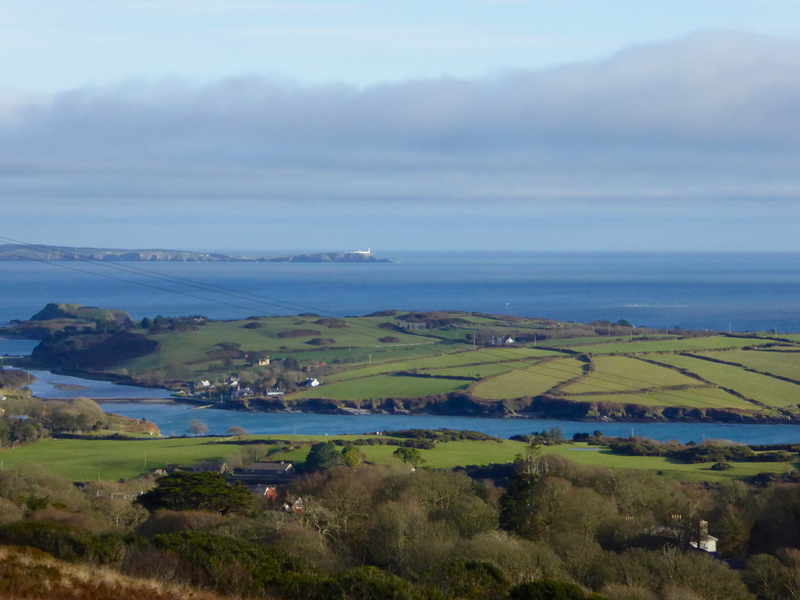 There is no evidence to suggest that the friars were disturbed by the events of the Reformation until the island was garrisoned by the English following the Battle of Kinsale. 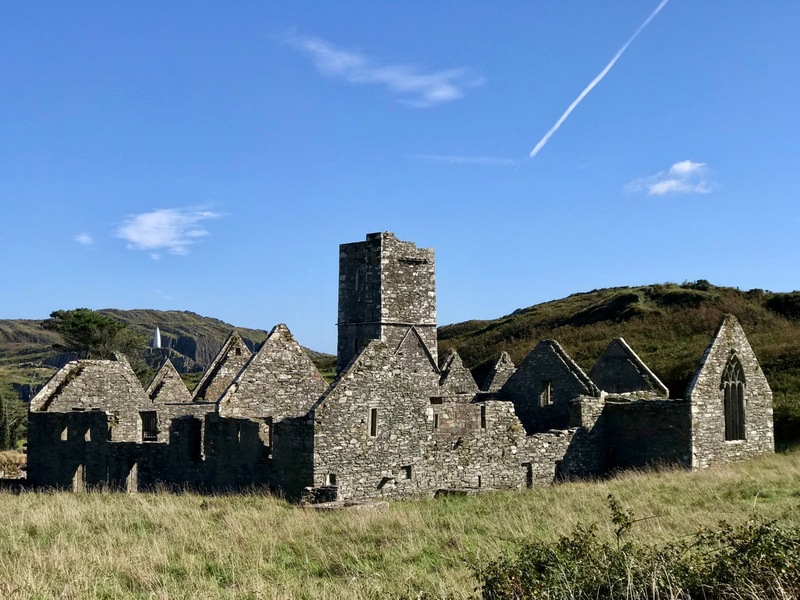 The friars soon returned and, except at the height of the Cromwellian persecu­tion, were active all during the seventeenth and well into the eighteenth centuries. 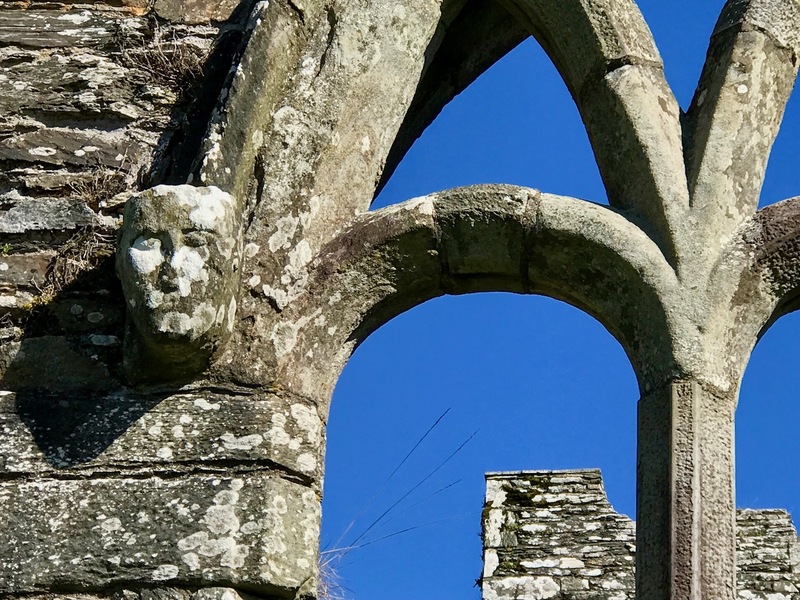 The last friar, Fr Patrick Hayes, died soon after 1766 . . . 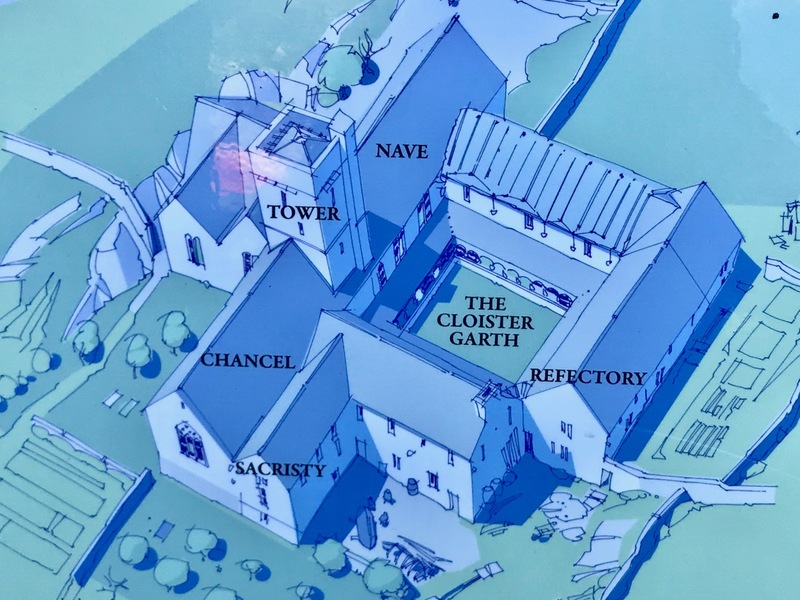 In the picture above – taken from the OPW information board – you can see the attacks of 1537 by ‘the citizens of Waterford’ on both the Friary (in the foreground) and the O’Driscoll stronghold of Dún na Long (beyond). 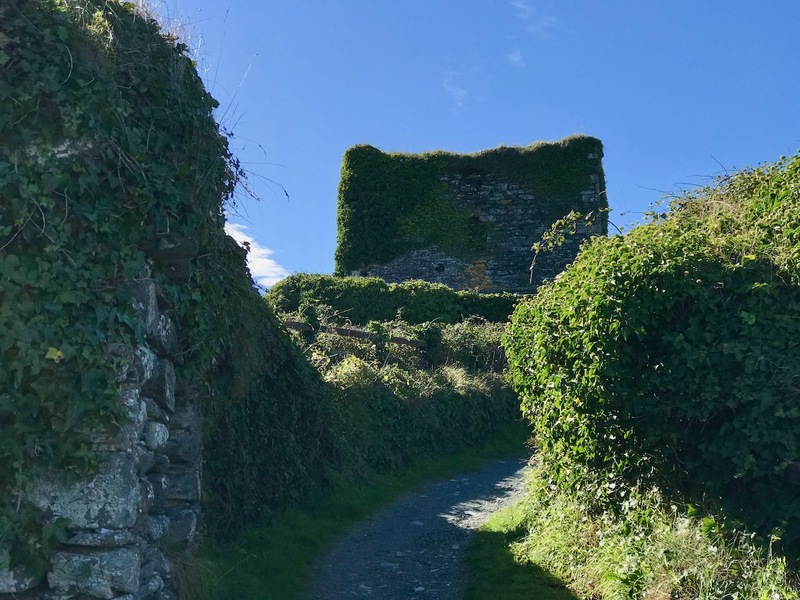 The castle was subsequently partially rebuilt and was garrisoned by a Spanish force in 1601. It was then acquired and restored by the Becher family in 1655 and remained in their ownership until the late nineteenth century. 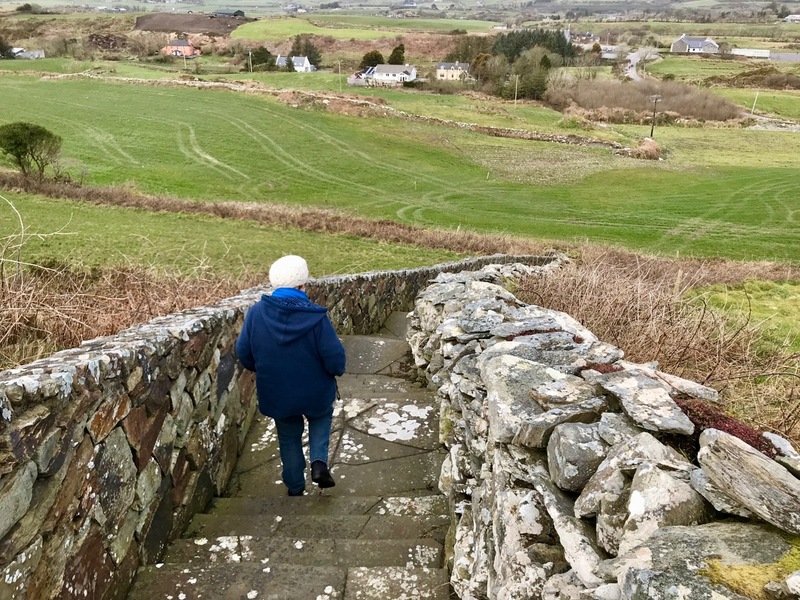 We went to see what remains of the castle today. 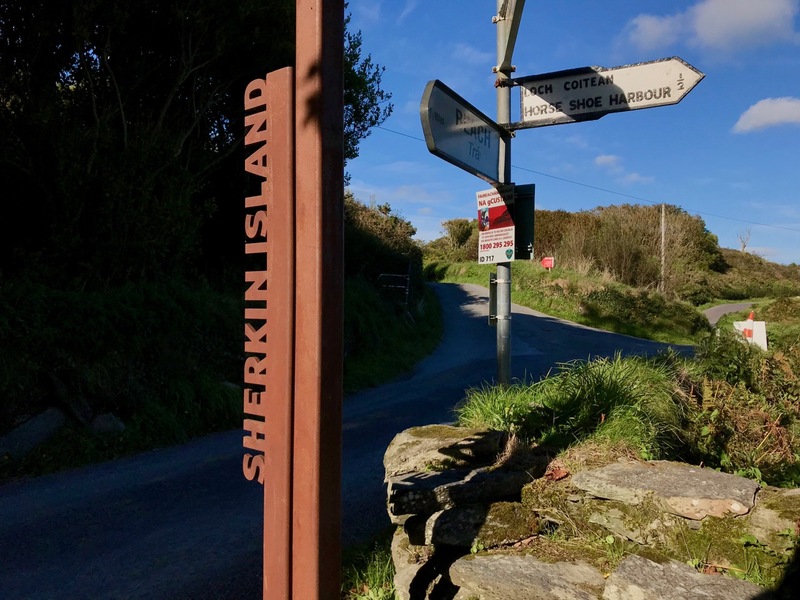 Our visit to Sherkin only took an afternoon – albeit a golden one. There’s plenty more to see there – and other islands to be investigated. 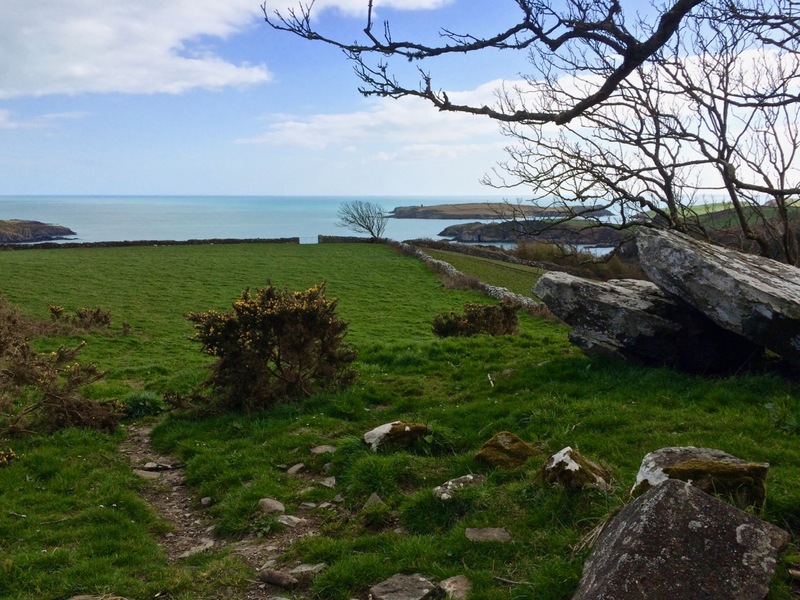 And an endless exploration of history to be had in the landscapes of West Cork. 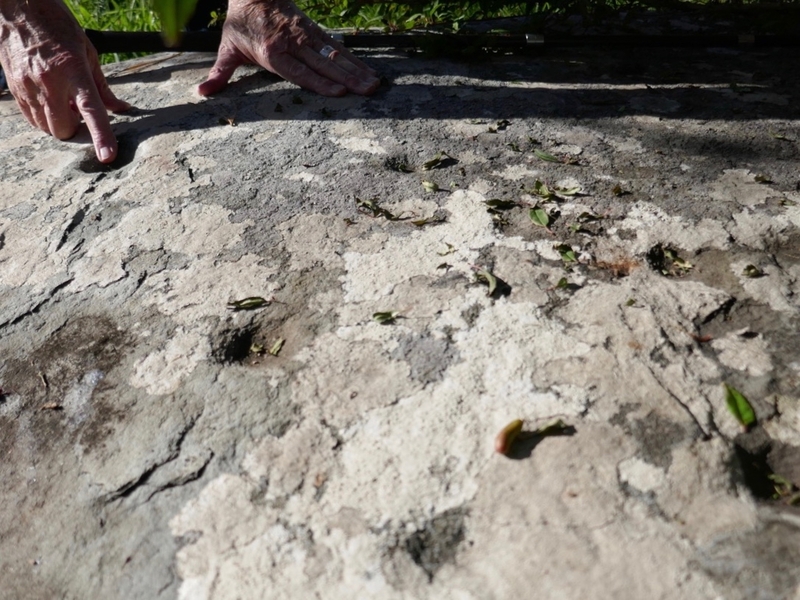 QUESTION: Is there a real difference between rock art and cupmarked stones? 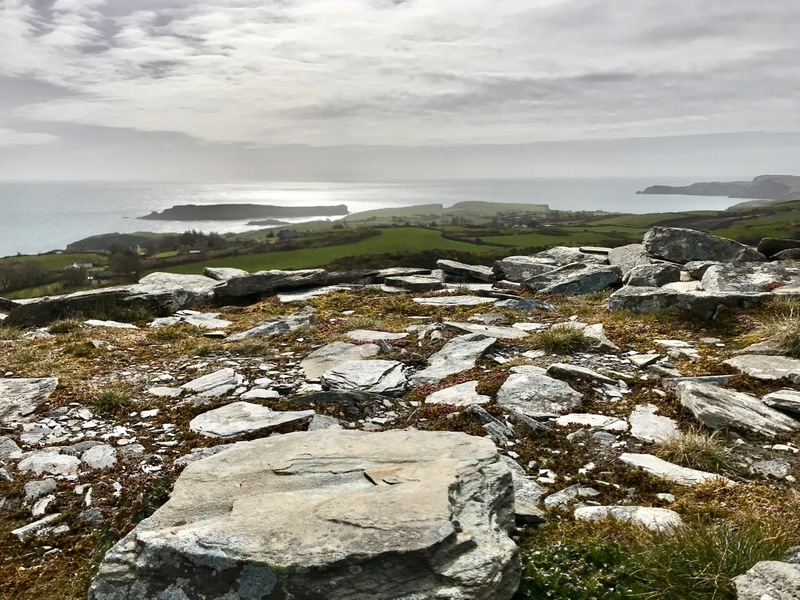 In recording the rock art of County Cork so far we have concentrated mainly on those examples described in the National Monuments Records as rock art. 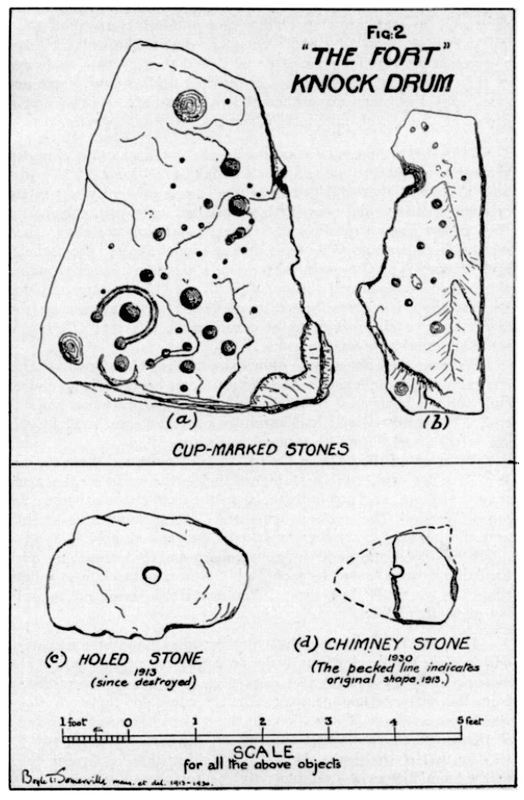 In the course of planning the Cork survey, years ago, a decision was made to distinguish between rock art and cupmarked stones and so they are listed separately. However, other counties appear to lump them together, or use the generic term rock art to include stones bearing only cupmarks. 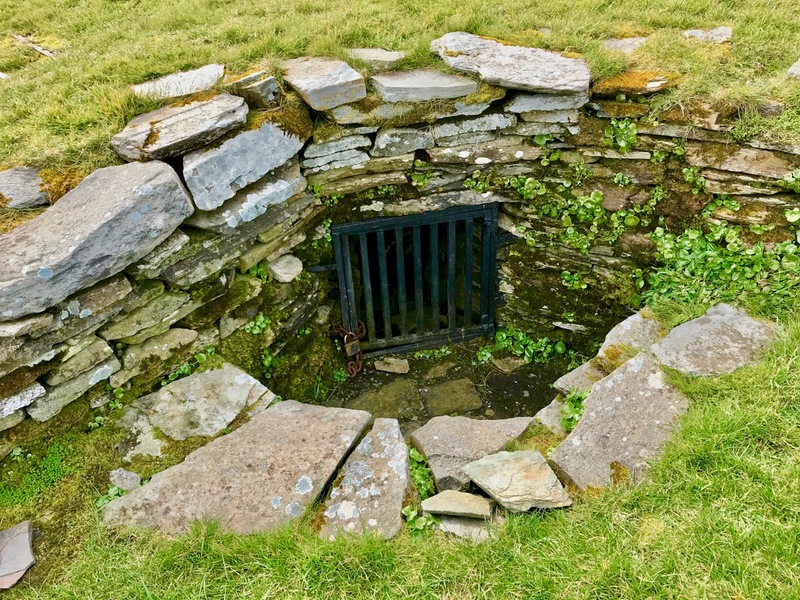 In addition, some monuments are classified using their most distinctive feature: a wedge tomb or a standing stone, for example, may well bear cupmarks on a surface, but do not therefore show up as examples of either rock art or cupmarked stones on the records. 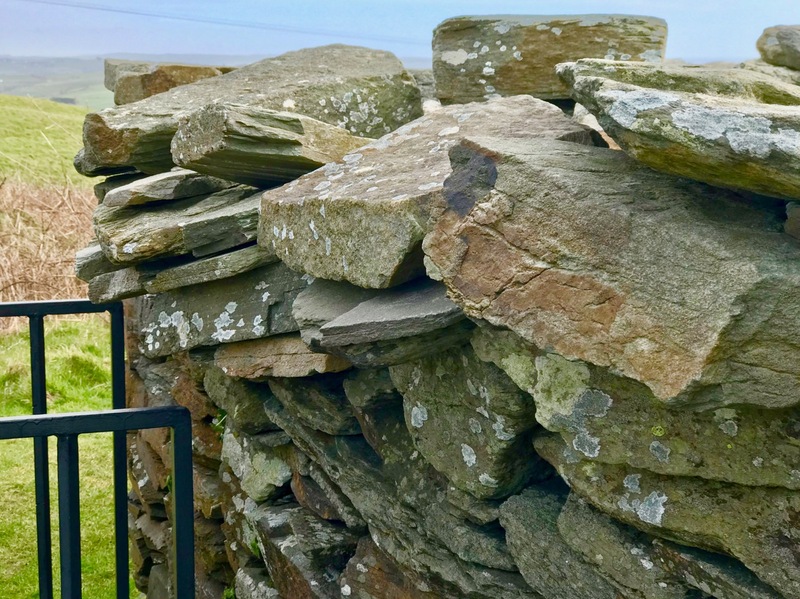 This is how the National Monuments Website describes cupmarked stones: A stone or rock outcrop, found in isolation, bearing one or more small, roughly hemispherical depressions, generally created by chipping or pecking. There are a total of 99 examples listed in Ireland, of which 64 are in Cork. However, as we have seen above, this is an arbitrary and misleading classification and varies from county to county. The number of cupmarked stones that fit the NM description is likely to be much larger. 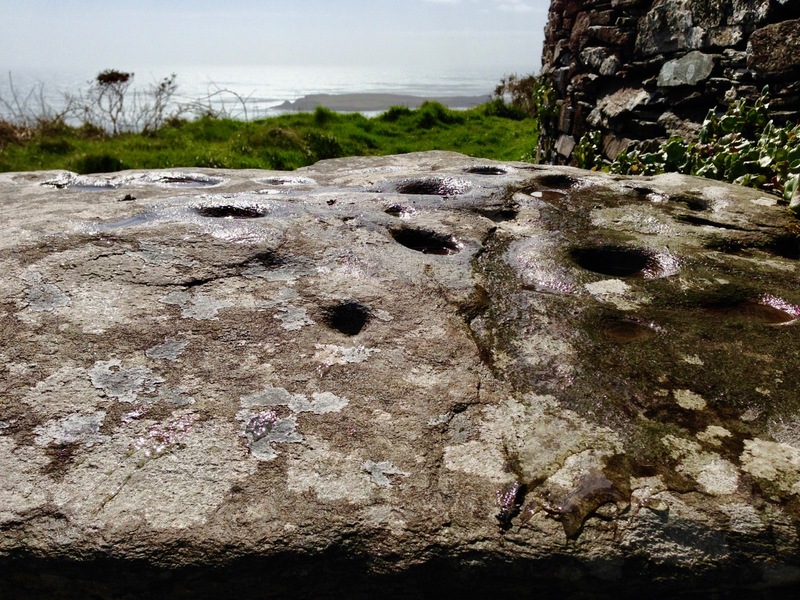 The question is – should we preserve this distinction between stones labelled rock art and those labelled cupmarked stones? Is it useful or merely confusing? The cupmark is the most basic and numerous element or motif of rock art in Ireland and elsewhere. 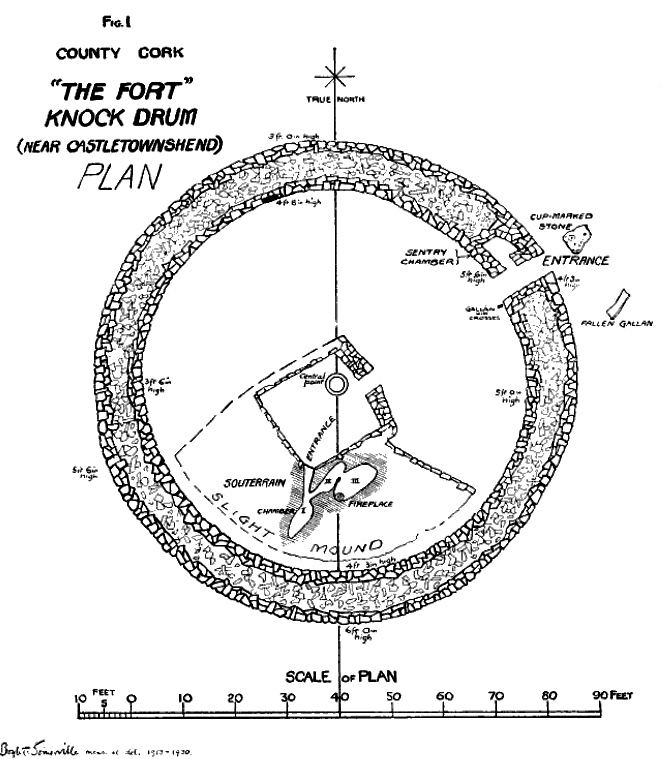 In the examples labelled rock art in County Cork, they occur with other motifs, principally concentric rings, sometimes with radial grooves, and a variety of curved or straight lines. They can be incorporated within a motif (as in cup-and-ring marks, rosettes, or where enclosed by lines) or they may be scattered, seemingly randomly, over the surface of the rock, between and among the other motifs. Since we have almost finished our recording of the rock art examples, we have moved on to focusing on those labelled cupmarked stones. As we spend time in the field recently with this class of monument we have begun to appreciate their differences from and similarities with rock art. Let’s start with what differentiates them from rock art, apart from the obvious fact that the cupmark is the single motif employed in the carving. Where a stone is smaller and moveable, it is more likely to bear only cupmarks. This also makes them more vulnerable to loss and to incorporation into field walls and other structures. While there are examples elsewhere, here in Cork we have found no examples of cup-and-ring carvings on small, easily moveable, stones. We have found cupmarks on boulder burials here – Bohonagh is a good example, and Derreennatra (currently hidden under a mound of compost) may be another. 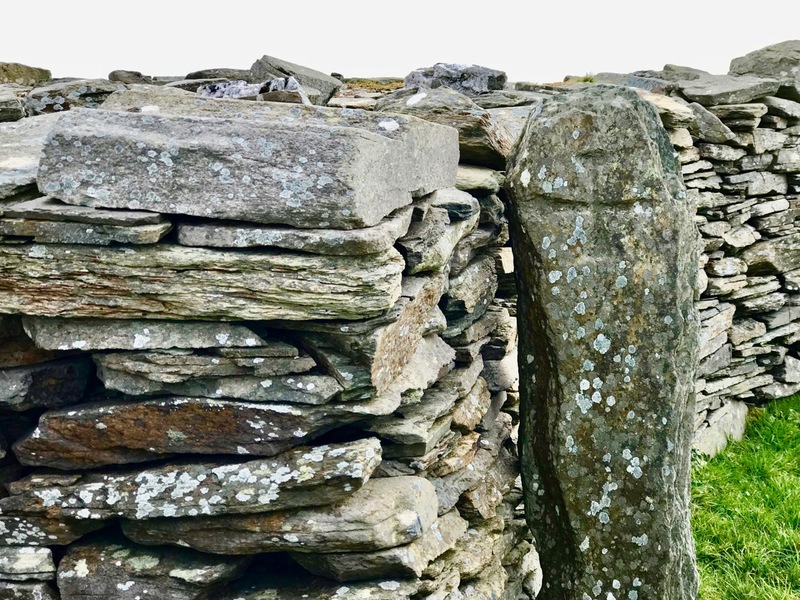 In general standing stones, where they have carvings, are more likely to have only cupmarks (we have three exceptions to this in West Cork). 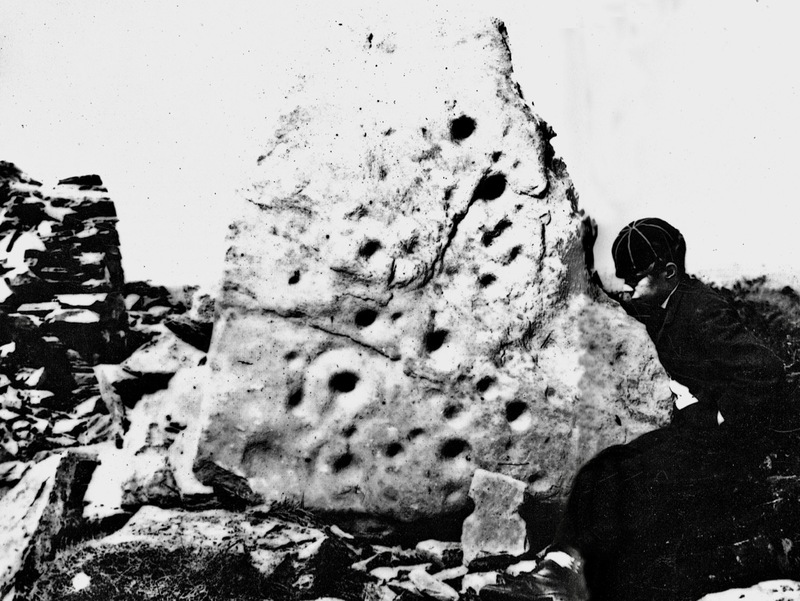 The Bluid stone has cupmarks on both sides – there are no Cork examples with rock art on both sides. Now – what’s the same? Location: Most cupmark-only carvings are found in the open countryside, on large earthfast boulders or rock outcrops. 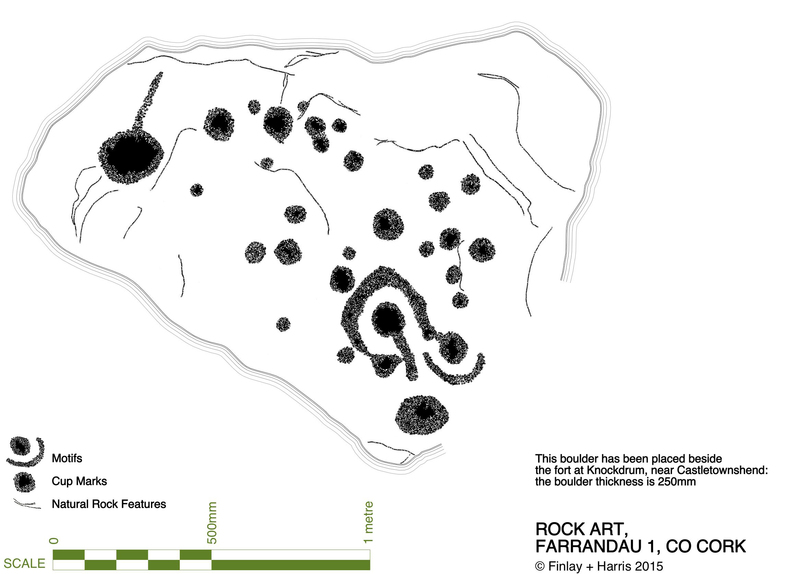 Clusters: as with rock art, cupmarked stones are often found within a kilometre or two of other examples or are within sight of each other or within site of rock art (intervisibility). Carving technique: where it can be discerned, it appears to be the same as for rock art – pecking with a harder stone. In the case of some of the shaley sandstone that laminates easily, it is impossible to tell how the cupmarked was formed – it may have been simply bashed out. 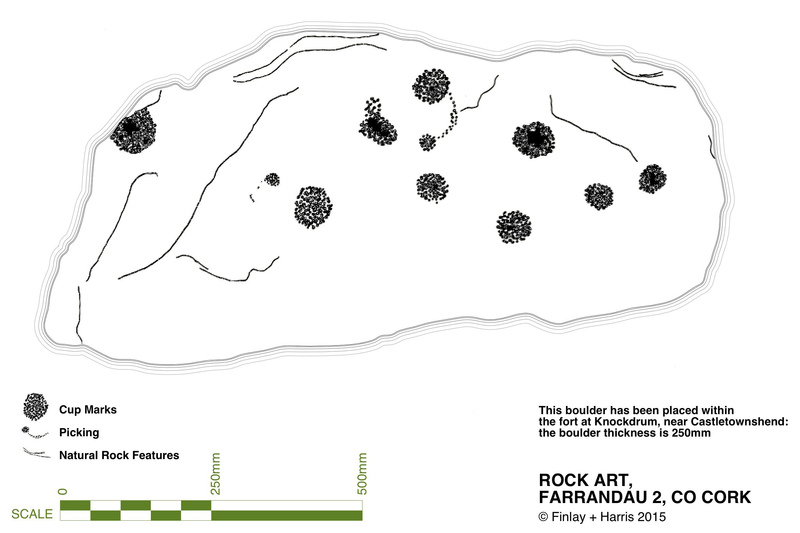 Siting: where the cupmarks are found in situ, their siting is equally spectacular to rock art. In particular, many of them are found on rising ground with strongly marked horizons that include views, even quite distant views, of Mount Gabriel, Mount Kidd, or other prominent horizon features. The sea, or water in the form of a lake, stream or river, is often a feature of the vista from the rock. We have not worked with enough of them yet to form any opinion on whether they are sited at what may have been routes through a landscape or territorial boundaries. Patterns: as with more complex rock art, often the cupmarks appear to be scattered randomly over the surface of the rock. However, patterns of straight lines, or of rough circles or semi-circles, can be made out in several of the stones we have recorded to date. In researching this piece we have been influenced by Christiaan Corlett’s book Inscribed Landscape: The Rock Art of South Leinster. 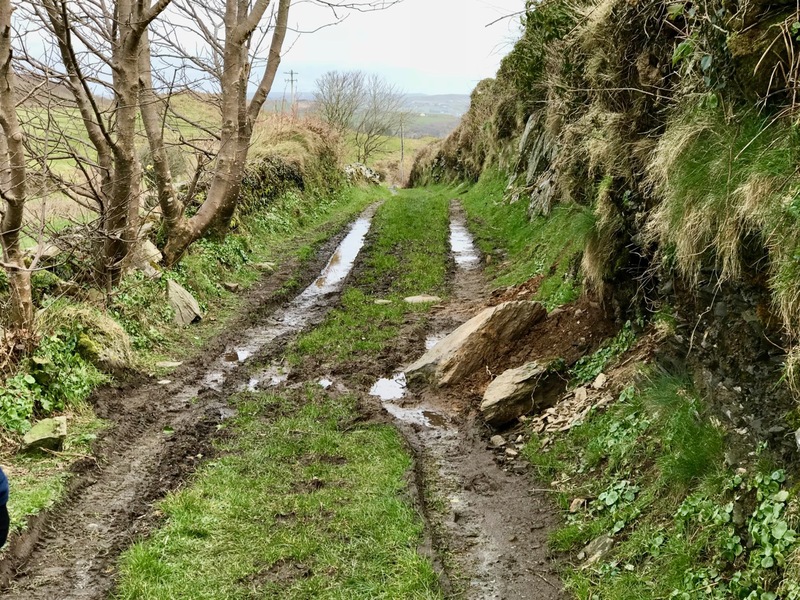 Christiaan is an archaeologist with the Dept of Arts, Heritage and the Gaeltacht and specialises in the archaeology of Leinster, and especially Wicklow. 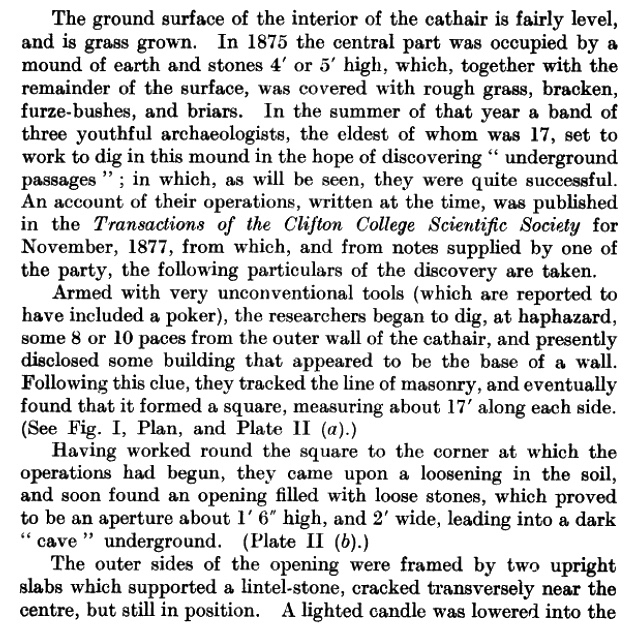 His book has been the first to catalogue the extensive body of rock art in the South Leinster area (indeed the first published work on rock art in Ireland) and in his corpus he includes both cup-and-ring art and cupmark-only stones without undue distinction. He notes many of the same things about rock art that we have observed. 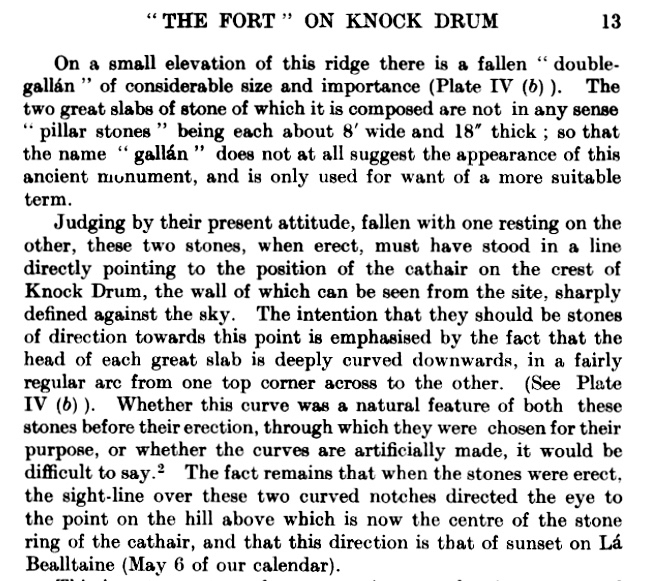 For example, he was struck, as we were, by the dominance of high mountains (in his case, Mount Leinster, the Blackstairs, or Brandon Hill) in the horizon views from the rocks he studied, and by the intervisibility of stones from each other. Arguably, it is only within the context of the overall composition that we may come close to some comprehension of the motifs found in rock art. Even the meaning of a completed composition, however, may only have been understood by the person(s) responsible for it. Perhaps the symbols represent a complex message of family history or a personal spiritual journey associated with an initiation ceremony or rite of passage, or perhaps they simply served to delineate family, tribal or sacred boundaries… [There is] a natural temptation to focus on the more elaborate designs and compositions found in rock art, as if they are more important because they are more accomplished. Yet the frequency of compositions consisting solely of plain and unelaborated cup-marks should not devalue their significance. Clearly their commonness would strongly suggest that these examples were just as important as, or maybe even more important than, the most elaborate examples of rock art found in the region. Given the intrinsic simplicity of a composition consisting entirely of cup-marks, however, it is arguably impossible to decipher or decode the specific meaning of the symbols themselves. That is not to say, of course, that we cannot attempt to understand the broader message of rock art, particularly where a complex of sites can be analysed. In such cases it may be the context of these sites that will provide the key to unlocking the meaning of rock art, in terms of the position and relationships within a given landscape, and the relationship with other examples of rock art on the vicinity. 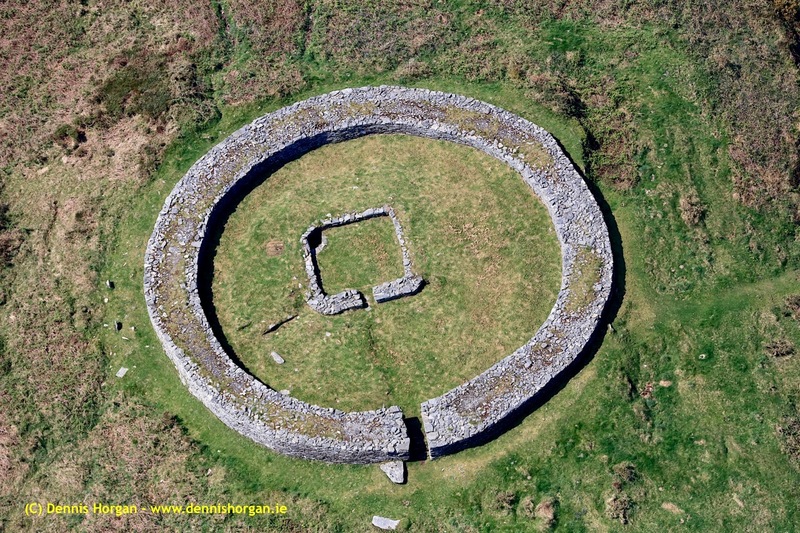 Christiaan deals with the similarity of cupmarks to the bowl-shaped depressions known as bullauns, assumed to be Early Medieval. But that’s a topic for another day. 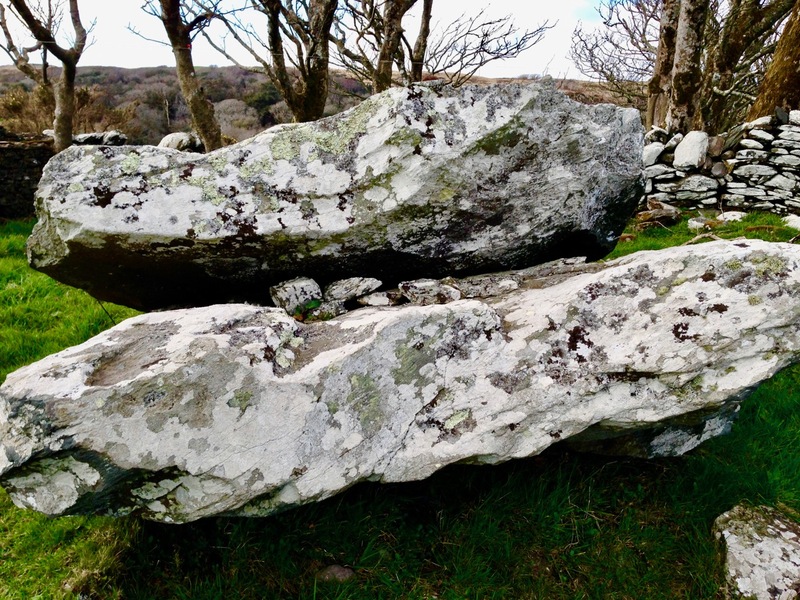 Suffice it to say here that one of our favourite stones, Castlemehigan, may have both cupmarks and bullauns on its surface, as well as a cross indicating its later use as a mass rock. 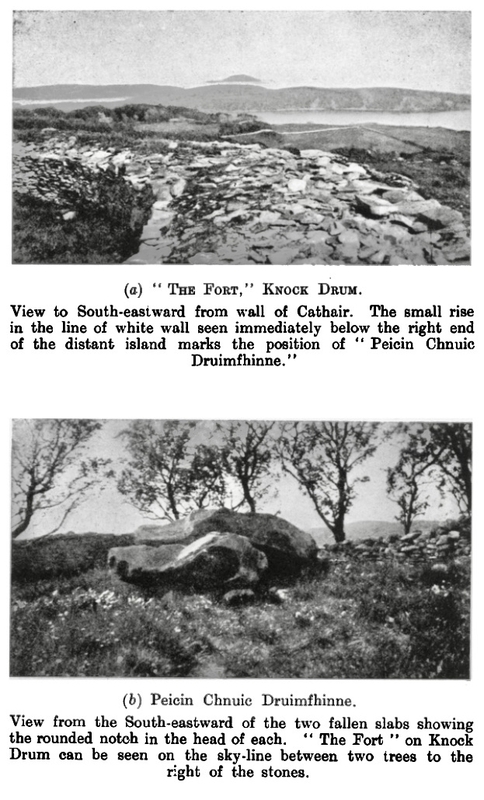 In its extraordinary mix of seemingly-randomly-scattered but also possibly-linear-arrangement of cupmarks; large bowl and basin-shaped elements; a spectacular siting that includes views to a distant Mount Gabriel and a closer view of the sea; a nearby cluster of other cupmarked stones; and the folklore that surrounds it – this very special cupmarked stone embodies all that is wonderful about this class of ancient monument. 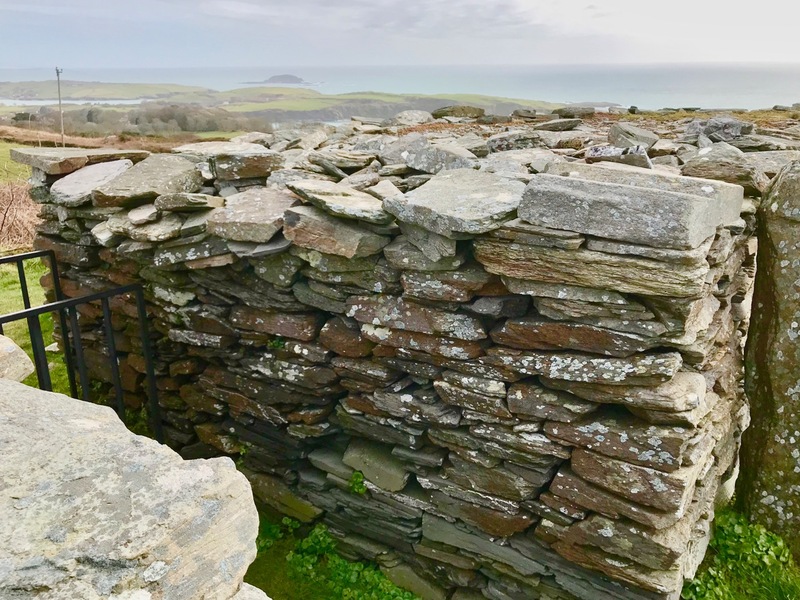 To come back to the question we posed at the beginning – should we preserve or abandon the notion that we are dealing with two classes of monument – rock art versus cupmarked stones? Our answer is that we’re not sure. What do YOU think? 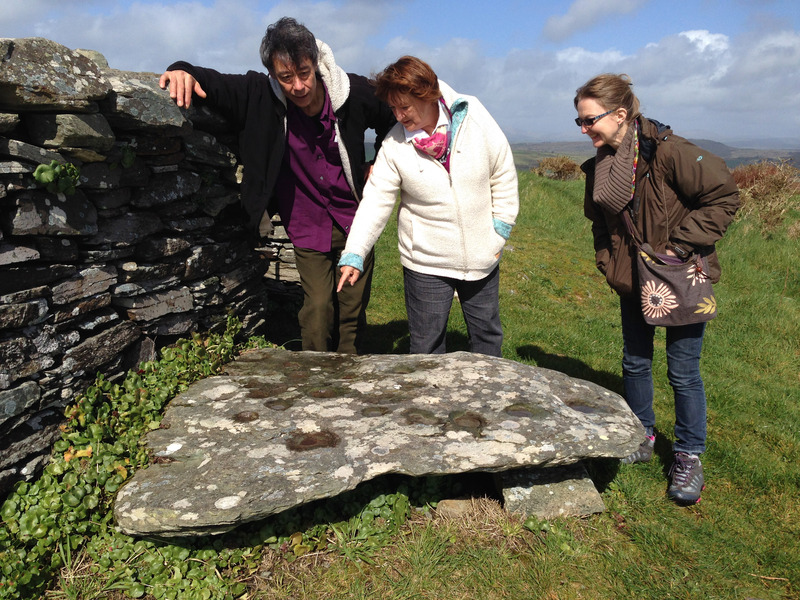 For those interested in more of our posts on rock art, go to Derrynablaha Expedition and scroll to the end for a list.